You'll see in the picture below that I'm going to have a problem here, in that the prop shaft isn't going to line up with the output shaft from the cylinder, not by a country mile it's not. So, what do you reckon, guys...double Huco coupling? 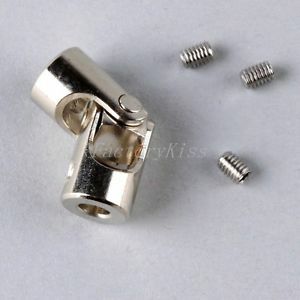 Silicone tubing? 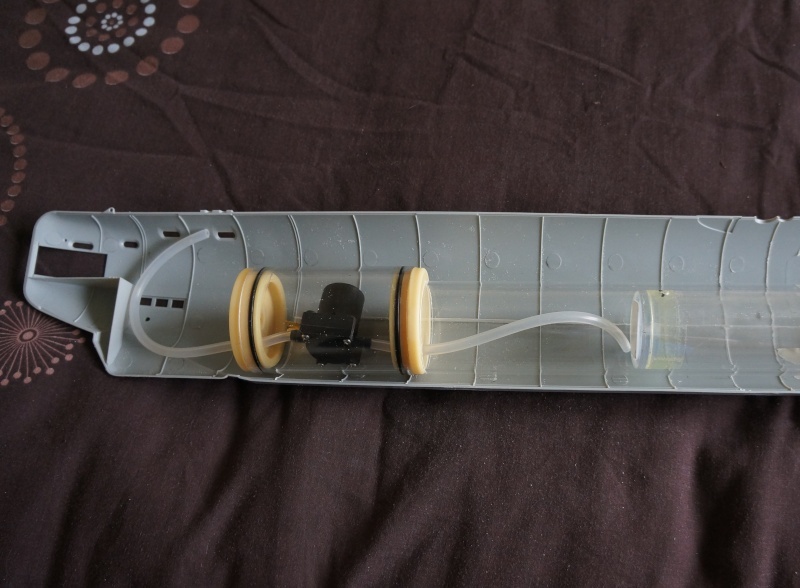 I don't want to resort to pulley wheels and O rings unless I absolutely have to...any ideas? As a last resort I could raise the cylinder, but that would mean all sorts of troubles and making up saddles, etc...it fits absolutely perfectly where it is. I think that may be the answer, Marius...just realised that I've been using the wrong cylinder, the correct one is 60mm od, not 80mm! 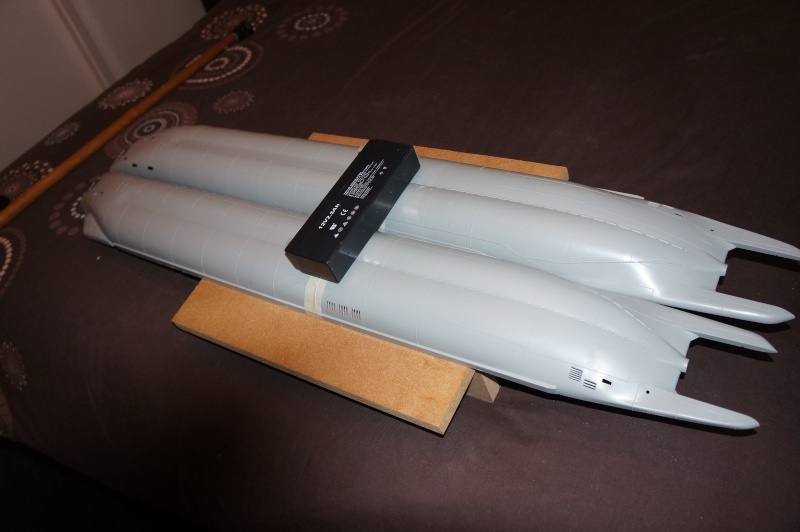 The smaller one will fit a bit higher in the hull, which will help the problem. You are right but I didn't mention that solution becouse of the price ......or is les expenceive?!. I already have the cylinder, practically finished, Marius...it's the one from the Dragonfish, it fits perfectly. I'm just waiting on the end caps arriving, I have them on order, shouldn't be much longer now. But first, I have to glue the hull together...then make the dreaded long cut in it. Very neat geared MFA motor installation, Richard. Has that got the shaft seal in as well? It's one of Nigel's cylinders, David...he made it for me for the Skipjack, it seems to fit the Type XX111 as well. Two for the price of one!! Not so nice...when the hull sections are placed together, that cylinder is a touch too wide. That one is 80mm diameter, the largest that fits the Type XX111 is 60mm. Luckily, I had a 500mm length of 60mm tube doing nothing, so all is well...Mark at MMB is making me up a set of end caps for it, and today I'll be making up the tray to hold all the bits and pieces. Only trouble is, the usual water pumps don't fit the tube, so I have to fathom out a way to get the pump in. I think I may have solved that problem...fit the ballast pump in it's own little wtc up in the bow section. A short length of 70mm tube just about fits, and that's just big enough to fit a water pump into after removing the original mounting plate. With a bit of luck, this will work ok, when my medication kicks in later I'll do a test run. Now all You have to do is power up the pump. Not to mentioned is a plenty room for another stuff in the same cylinder!.....maybe!. The front dive plane micro servo. The electronic fail safe which will blow the ballast tank if the signal is lost. 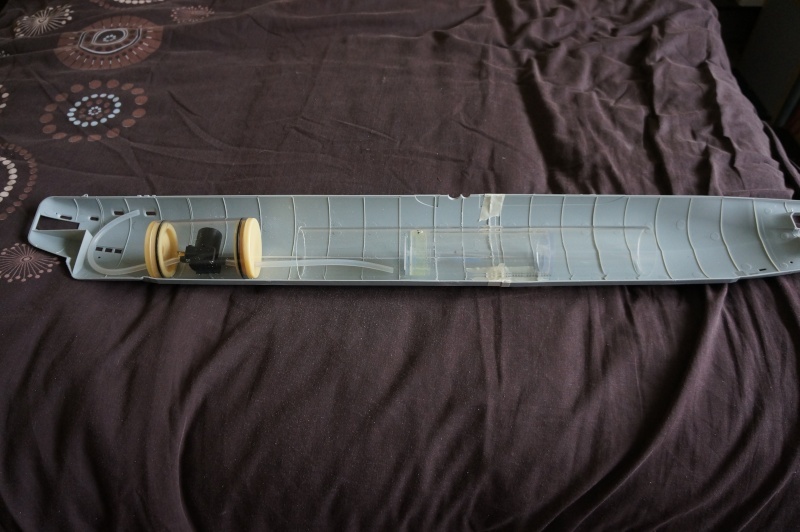 Centre part holds the ballast tank. 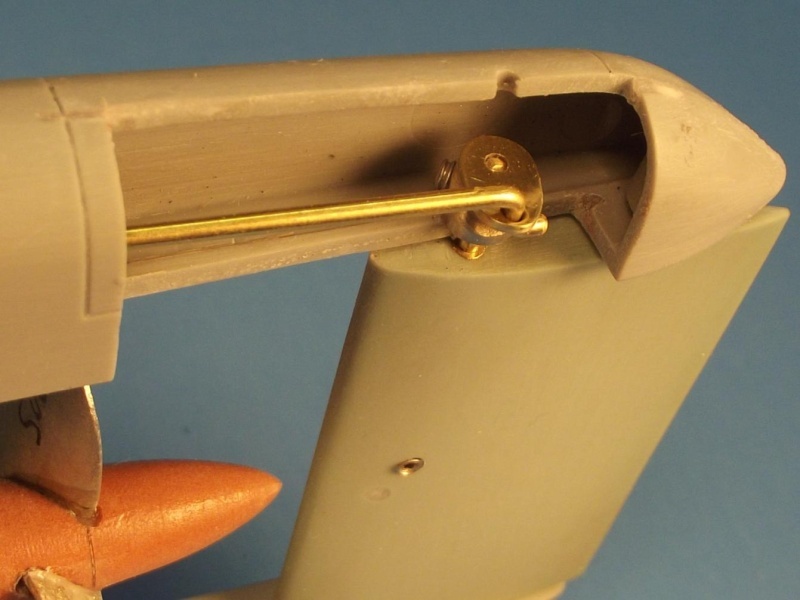 Two micro servos for the rear dive planes and the rudder. A 11.1v 2250a/h LiPo battery. The motor, a 385 high torque, low drain one. The electronic LCD battery monitor. If things don't work out as I want them to, the alternative is to use a 12v 2200a/h stick of AA sized NiMh batteries under the cylinder. The X Craft has been hidden away out of my doctor's sight, the Skipjack is sitting on it's build stand until I've been into hospital, so I've made a start on the Type XX111. 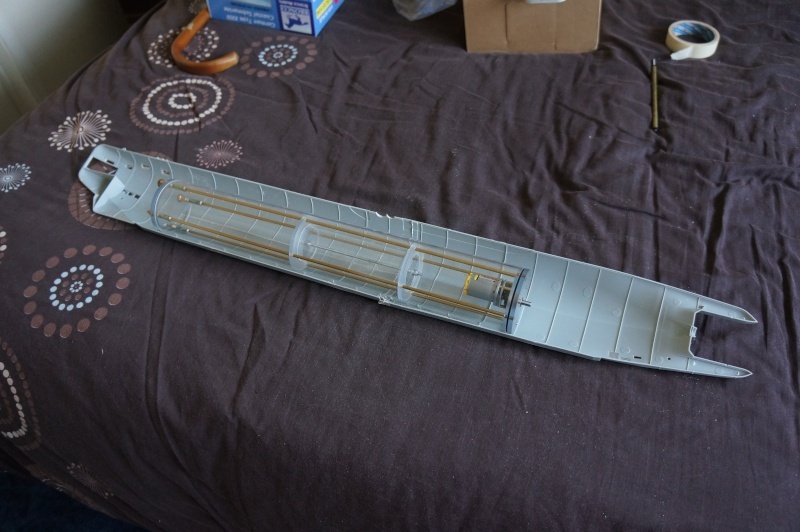 The hull sections are ready to join together, but before I do...David Merriman, is there anything I should be doing before I attach the halves together? Richard(Admin) wrote: The hull sections are ready to join together, but before I do...David Merriman, is there anything I should be doing before I attach the halves together? Yes, Richard. Read this WIP thread and study the pictures and text, from page-10 till the end of the article. That should guide you along nicely. Excellent...thanks David, much appreciated as usual. 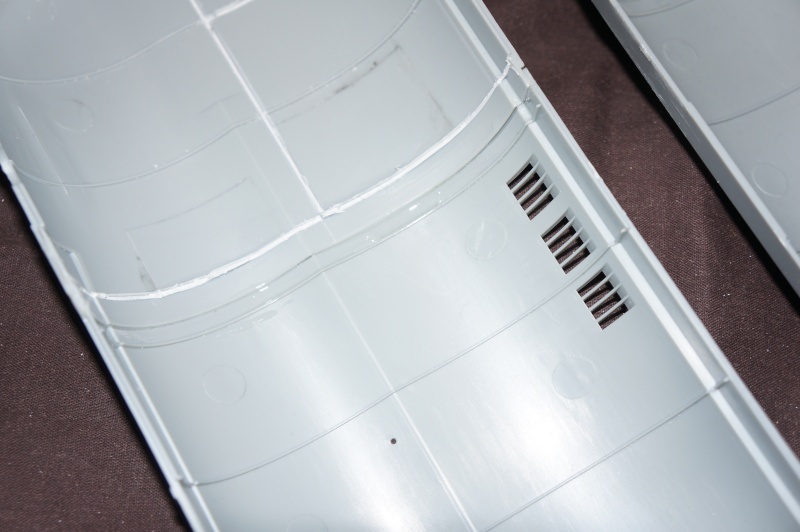 The two hull sections have gone together very well, I applied a layer of plastic weld to the places indicated on the plans, and when that had dried hard, I went over the joint inside with a fillet of the same glue, applied with a finger. This morning, everything has dried off rock hard, and with hardly a gap anywhere, just a tiny amount of filler needed in one or two places, that's all. I'm well pleased with that...now to study David's instructions on the next steps before I even think of picking up the glue bottle again. Just shave the inside of the port upper rudder support, adjacent to where the rudder bell-crank will go to give the later installed bell-crank room to swing. 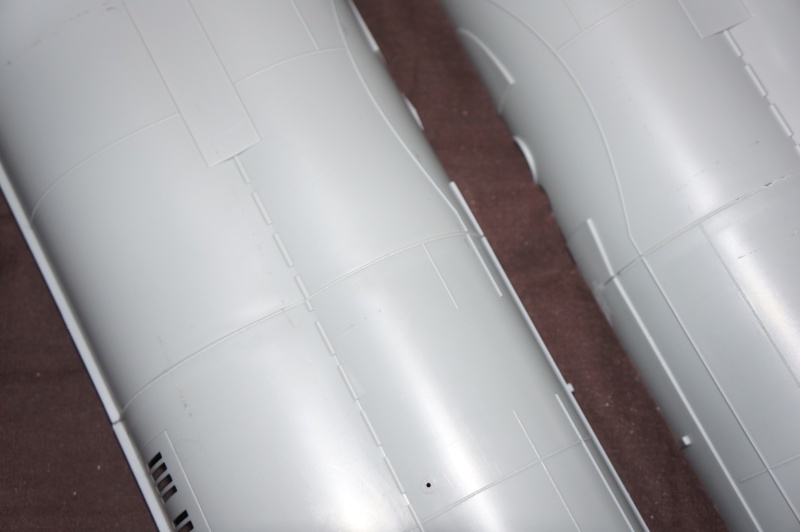 Do that and you are clear to glue the port and starboard sides of the hull together. Once you have the hull put together, cut away the top of the hull (follow the instructions). And once that's done you have access to work out all the linkages, propeller foundation, and other internal jobs. Ok, got that...I've been reading through that link you sent me and downloading pictures to a usb drive, that way I can use them for reference as and when I need them. It looks a bit tight up in the stern where those rudder linkages go...looks like a fun time ahead. Sorry...that should read ''the opposite side to this''. Richard(Admin) wrote: Ok, got that...I've been reading through that link you sent me and downloading pictures to a usb drive, that way I can use them for reference as and when I need them. It looks a bit tight up in the stern where those rudder linkages go...looks like a fun time ahead. On the initial kit assembly I went with a removable portion of the port upper rudder support structure -- this to access the rudder bell-crank. 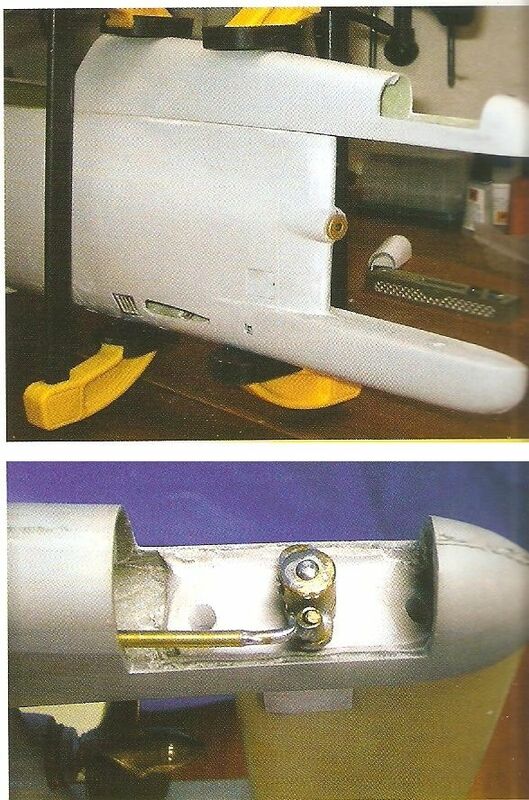 During the second assembly of a kit (that one using the fittings kit parts formed to fit the first kit I assembled) I found the removable access portion, we see in this photograph, redundant -- the pushrod, with bell-crank tack-glued to it, could be fished into the upper support structure from within the hull as the rudder operating shaft was pushed up from below. Hence, no need of the access hatch. Yes, a 'fun' time ahead, Richard. I have mine enclosed, but am contemplating cutting it open like you have shown here, but use magnets to hold it. If I go this route, I will let you know.